I came across my property listed on your site. The castle shown is yellow and is located next to the 101 freeway in Hollywood, CA. The castle is known locally as Castle Ivar, named after the street it is located on. 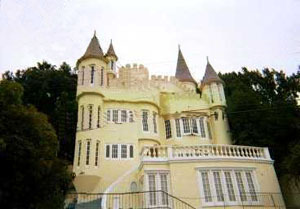 The castle is a 5 story private residence and has just recently been remodeled. The castle is scheduled to be painted next year. The castle's greatest attribute is it's location. It is easily viewed clustered in with many other legendary buildings in Hollywood such as the Knickerbocker hotel and the Capital Records building. There is a full page photo of it in The Ultimate Hollywood Tour Book and numerous people drive up Ivar Avenue to get a closer look. The property was built in the early 90's on a site that was a home from the 20's. The property is across the street from Marilyn Monroe's teenage home and 2 doors down from Hopalong Cassidy's home during his Hollywood days of fame. The views from the rooftop deck are of the entire LA basin to the ocean and of course all of Hollywood including the new Kodak Theatre, home of the Academy Awards. The castle is best viewed from the 101 freeway at the Vine street exit. I have owned the property since 2001. I found a website on one of the castles you have listed, Castle Ivar. Picture courtesy of Paul Ford. Information courtesy of Mark Rollings.